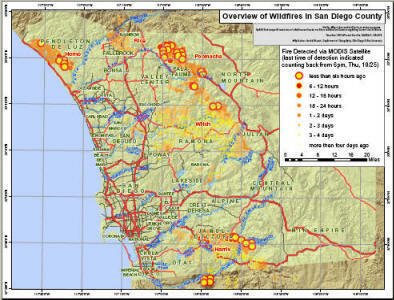 Internet Mapping Services for San Diego Wildfire 2007, by Department of Geography, San Diego State University. 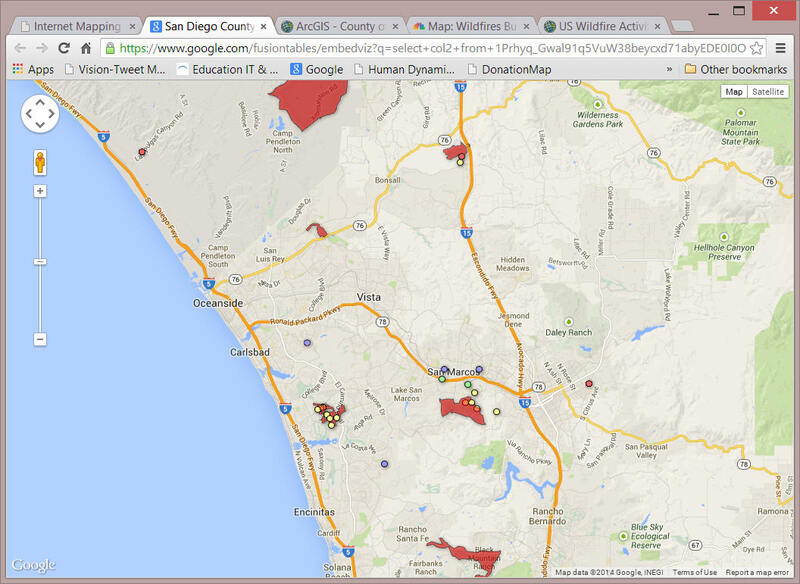 If you are looking for recent 2014 San Diego Wildfires information, please link to here. (5/13/2014 MODIS Satellite image (Aqua) overlay with streets). 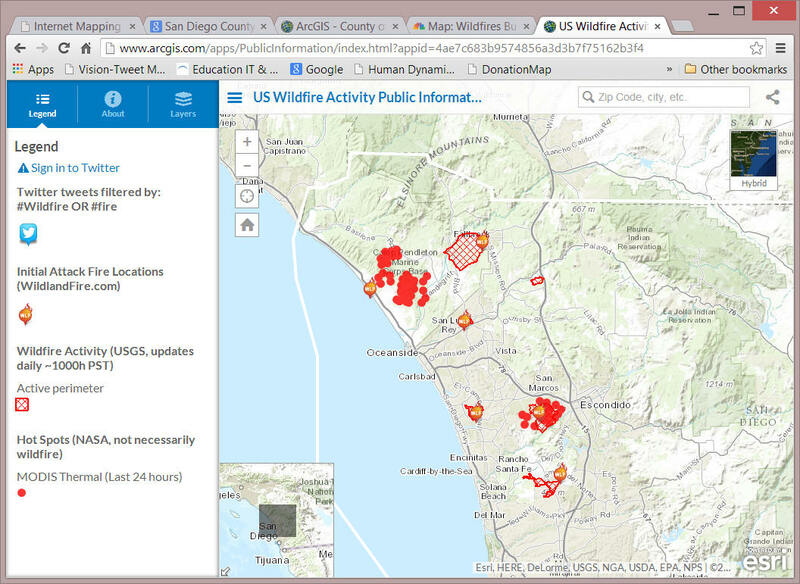 This website is maintained and updated by the San Diego GIS force group, a volunteer group of SDSU faculty and students. (Disclaimer: Since all GIS layers in these mapping services are derived from external sources, SDSU and the Department of Geography will do our best to provide useful information. However, we can not guarantee the accuracy of these data from external sources). If you have any questions or suggestions regarding this website, please contact Dr. Ming-Hsiang Tsou, at the Department of Geography, San Diego State University or <gisforce@geography.sdsu.edu>. 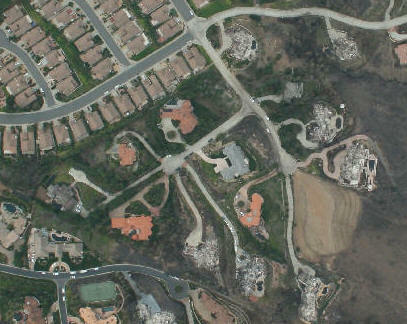 Aerial Photos (Georeferenced) for damaged areas and buildings. High Resolution Satellite Images from FORMOSAT-2 ( Daily images: Oct. 24, 25, 26, 27, 28, 29, 30). NEW! NASA EO-1 and IKONOS Satellite Images (preview image). 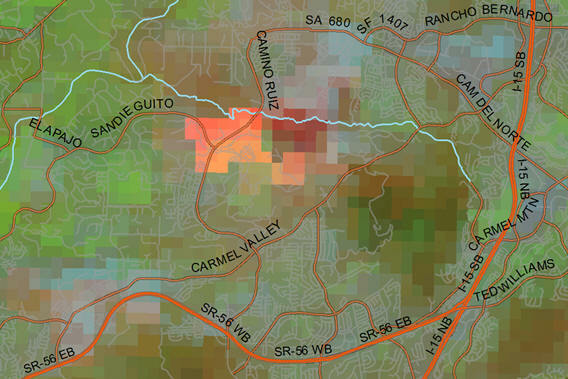 GIS Data (Fire Perimeters) and baseline layers provided by San Diego County EOC, SanGIS, and SDSU Geography Department. The San Diego Fire Wiki ( http://sdfires.pbwiki.com/ ) This is a collaborative Wiki to organize Information on the San Diego 2007 Wildfires. You can contribute your own information to this on-line information portal or get the most updated information regarding the wildfires. 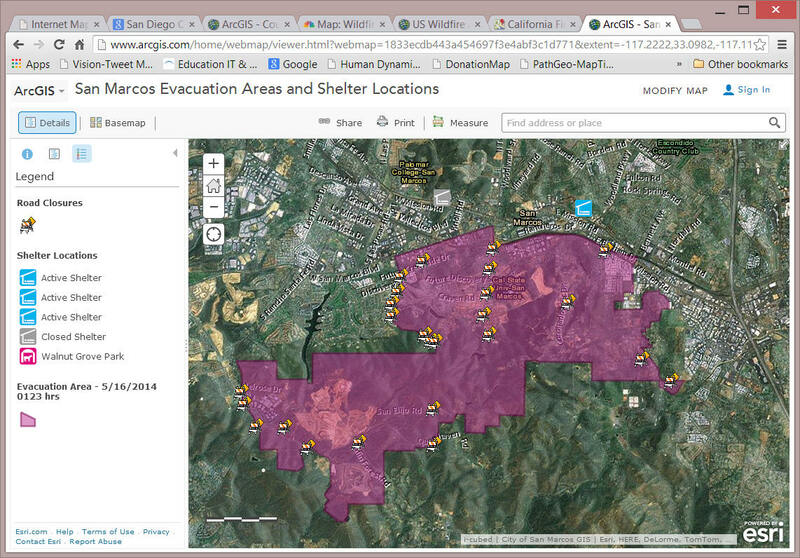 Evacuation Map Updates and GIS Maps. (the evacuation maps are updated ASAP once we get the maps from county Emergency Operations Centers (EOC). 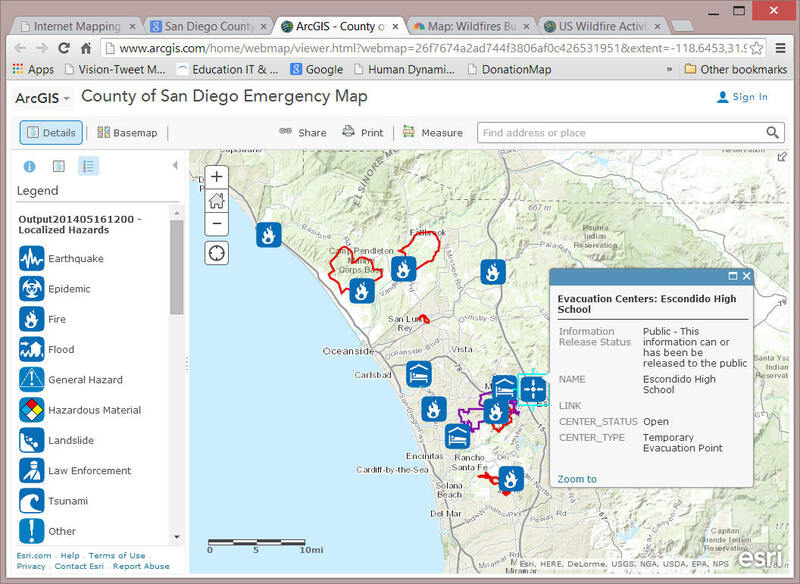 This web page includes major government websites (county and city) and GIS maps related to evacuation, traffic updates, power outages and related information. All evacuation orders have been lifted at 11:00am on Oct. 31, 2007 in San Diego County. Click Here to see the last fire perimeters update and evacuation map provided by the County's EOC. Damaged Areas Mapping. This page focuses on the damaged areas and buildings in San Diego. We will include geocoded addresses for the locations of damaged houses and other related information in this page. 3D Visualization and Animation Maps. Display of 3D terrain and temporal changes of the wildfires. We will also compare the differences between the 2003 Cedar fire and the 2007 wildfires. Satellite Images Overlay and Remote Sensing. This page collects all relevant satellite images and overlay them with GIS layers (streets, highways, rivers). 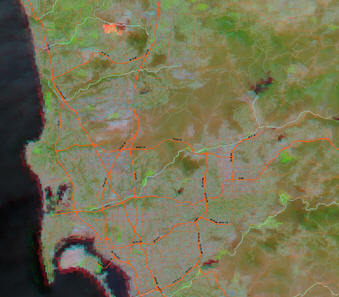 We also compiled a satellite images resource list for all related remote sensing data. Other On-line Mapping Resources This page will show a collective list of other on-line mapping resources related to the 2007 fires. How GIS (Geographic Information Systems) can help us fight wildfires? One of the major differences between the 2003 and 2007 wildfire responses in San Diego is the great GIS team collaboration in the County's EOC in 2007. The San Diego EOC GIS team did an extraordinary job this time and provided very critical and valuable mapping information promptly to the public and related government agencies. Animation of NASA MODIS satellite images (true color, Oct. 21-29 (New) (by Ick Hoi Kim). More images HERE. 3D Animation of the Fire 2003 (Orange color) and the Fire 2007 (Red color) (By Aude Esperbe) See detailed description in 3D Visualization page. Aerial photos (click HERE to see more pictures). Fuel Moisture Map (created by Madhura Niphadkar and Doug Stow) derived from indices taken from MODIS surface reflectance data with fire perimeter overlay. NEW Telascience San Diego Fires Map http://hypercube.telascience.org/fire/ (integrated images from multiple sources) created by John Graham. We apologize for the slow server performance in the first two days of the wildfires (Oct. 21 & 22) due to overloaded requests from Web users. Tuesday we were given access to major Intel computers at Calit2 at UCSD and special connectivity between SDSU and UCSD (OptIPuter) from which this page is now being served (special thanks to John Graham, Eric Frost, Larry Smarr, John DeNune, and Cristiano). It is super fast now. We will continue to update the wildfire maps and create some GIS maps / Recovery maps, as well as new imagery from NASA and other groups assisting in this massive effort. We also re-organized our website on Oct. 25 to provide a better layout of information for our community. -- Department of Geography, San Diego State University, Oct. 25. 11:00am. 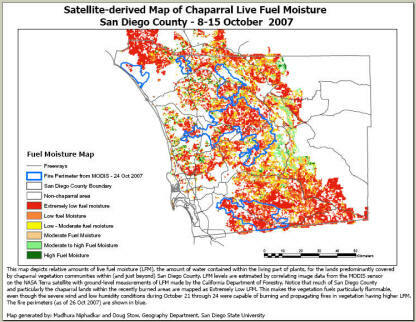 Link to the old San Diego 2003 Wildfire Web pages. 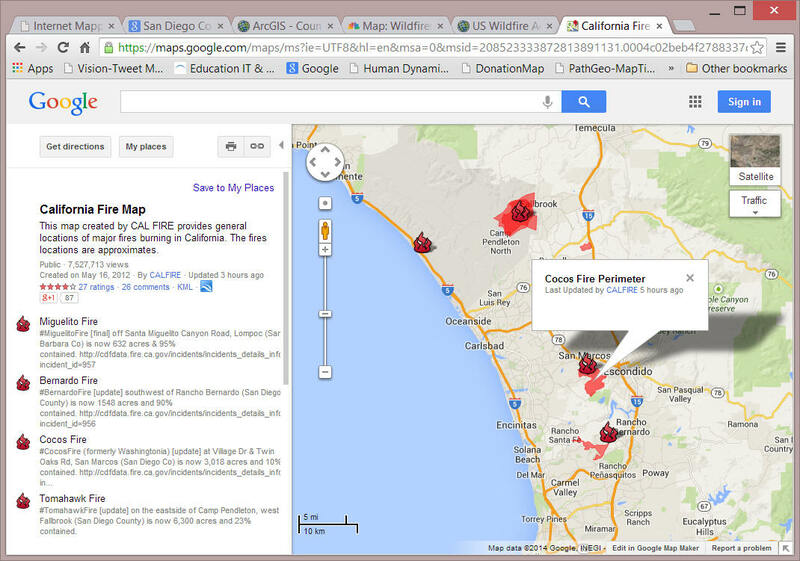 Link to the GIS data portal (2003) for San Diego Fire Recovery Network (SDFRN). 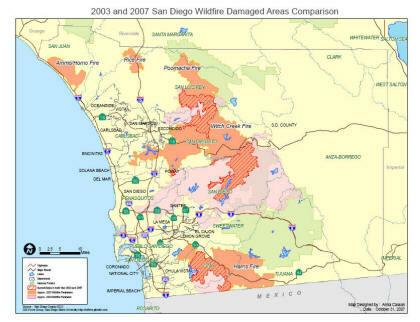 SDSU Geography Department was collaborating with San Diego Fire Recovery Network (SDFRN) in 2003 to establish a GIS data center for San Diego Wildfire Recovery and Management. 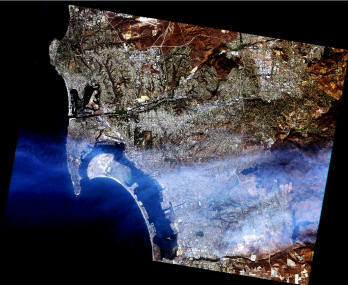 The GIS data center includes downloadable data (shapefiles and coverages and metadata) for San Diego 2003 Wildfires. The San Diego GIS Force Volunteer Group: Harry Johnson, Lloyd (Pete) Coulter, Ting-Hwan Lee, Christopher Lippitt, Aude Esperbe, Cristiano Giovando, Serge Rey, Andrew Gordon, Jennifer Larson, Ick-Hong Kim, Kimberly Dodson, Charlie Schmidt, Marcus Chiu, David McKinsey, Piotr Jankowski, Melissa Rosa, Boris Dev, Blake Brown, Tong Zhang, Charlie Adler, Arika Ligmann-Zielinska, Gagan Arora, David Folch, Gregg Verutes, Martin Lacayo-Emery, Andr'e Skupin, Madhura Niphadkar, Li An, Doug Stow, Grant Fraley, Ryan Burns, Xinyue Ye, Chung-Rui Lee, Raghuram Narasimhan, Anna Casson, Ming Tsou. Special Thanks to the following persons and organizations for providing valuable information for this website: Dr. Harry Chang and Kevin Chen (National Taiwan Normal University), Mr. Sam Wang (Taiwan's NSPO), Rich McCreight (Near Earth Observation Systems), Drew Decker (USGS), Bill Clayton, Paul Hardwick and Tricia Toomey (San Diego County Emergency Operations Office), Jeffrey Johnson (Pict'Earth), Tony Howser, ESRI, SPOT Image, Richard Maher, Google and its Google Earth Team. (This image is provided by Bill Clayton). This Website is updated and maintained by the Department of Geography, San Diego State University.